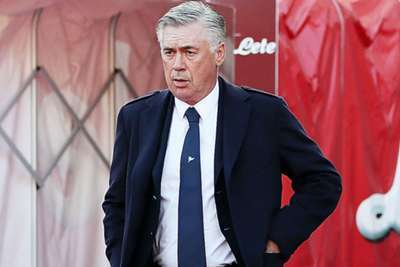 Carlo Ancelotti challenged Napoli to serve up a repeat of their October performance against Liverpool as they look to clinch a place in the Champions League knockout stages on Tuesday. The Serie A club sit on top of Group C going into the final round of fixtures and know a draw at Anfield will be enough to see them through to the next round. Yet Ancelotti insists the visitors will not be taking a defensive mindset into the clash with the Premier League leaders, who sit outside the two qualification spots following a 2-1 defeat to Paris Saint-Germain on November 28. Napoli won the reverse fixture 1-0 on Italian soil, Lorenzo Insigne grabbing a late winner, and Ancelotti believes that performance offers his players a recipe for success against Jurgen Klopp's side. "We have done very well so far and we will have a little advantage," the Italian coach told the media. "The cake has been made, now we need the cherry. "We know what's at stake. We need to take the final step to get through the group. "We haven't come here to sit back but to play our own game - we are going to have to be very focused and set out to score a goal. "I think we can draw on the first game at home, as it has given us a lot of confidence and we'd like to put in a repeat performance." That's it from @MrAncelotti and @R_Albiol! Opposite number Klopp has called for the home crowd to produce a special atmosphere, yet Ancelotti expects Napoli's travelling support to make plenty of noise. "Everyone knows the passion of the fans, but it's great to play these games in these stadiums," he said. "Anfield is an incredible stadium with very passionate fans. It is true that there will be many fans of Liverpool, but there will also 3,000 Napoli fans at the stadium and 40 million around the world."